This thing - this issue of deserving it - is something I think about much less than it did in my earlier incarnations of being a mom, when I had to remind myself that I deserved a shower, for instance, or dinner out with friends that meant missing bedtime. A greater sense of being ok with it all is part of what I’ve learned - earned, maybe - over the passing years and with growing children. I didn’t wrestle with myself too much about whether or not I should get go on this trip. I should! Everybody should! We all, whatever our place in life, deserve a break when we can afford to take one, however that break manifests, whether its a backyard and a beer or seeing flamingos in the wild in Mexico. Which, I will get to! What I wrestled with was the logistics. With Gabe and Nora in one school and Aidy in another, my existence seems so caught up in theirs, and crucial to our daily lives. Although the former two walk to school with a crew of friendly neighbors (I love you, neighbors), there are carpools to activities, and J does his part picking up kids during the hours he’s off work, I am mostly responsible for ensuring everyone gets out the door and where they are supposed to be on any given weekday. And, although we continue strategize ways to delegate this responsibility, I am generally responsble for buying and cooking nearly everything our family eats. Also, although everyone claims to love her so very much, I do not see any other members of the family taking initiative and walking our beloved dog. But, as I told J, “I don’t want to not go on this trip because I can’t figure out who is going to pick up Aidy from ballet on Thursday afternoon.” So I booked the tickets and we figured it out. Well. Mostly. And that’s important. Because in addition to becoming more relaxed about things like taking vacations or time to myself, I’ve also learned that if you leave people, including your family, to their own devices, they will almost always work out the details. So, J and I planned out most of the days for when I was away (THANK YOU SHEILA!) but not all of them, I packed my bag with summer clothes, which felt like a vacation in itself, and flew to Merida, Mexico, where I spent a week at Hacienda Petac, a.k.a. paradise, a.k.a. possibly the most relaxed I’ve been in my adult life. The accomadations are built for one group at a time, so me, my mom and her travel partners - a wonderful, well-traveled, inquisitive, and hilarious group of individuals - were the only ones there. All meals were included, as well as margaritas, which the staff offered regularly but not insistently (the ideal level of margarita-offering, in other words). There were lovely grounds I explored on the one and only run I attempted during the trip, jogging at a slow pace as I tried not to trample geckos and then scared myself into thinking there were maybe more than geckos - snakes? dragons? - in the tall grass along the path and ended the run ten minutes in (a margarita erased any remaining stress from this incident). There was a pool, a small spa, there were hammocks and, perhaps most enthralling for this Connecticut transplant who has tried and failed to get into winter, there were flowers everywhere. Creeping up the original wall of the hacienda and blooming heavy on draping vines. I could smell them as I drank my morning coffee - delivered straight to my room - and read the Michelle Obama autobiography on the rocking chair outside my door. And there were flowers at every meal, incorporated into the always-gorgeous table setup provided by the inventive, lovely staff. Best of all, though, this trip was steeped in culture, reminding me why I love traveling so much and providing a swift kick of a reminder to get more of it into our lives. Each meal was in the Yucatan style, and, as part of the hacienda’s offerings, we took several cooking classes, where we learned to make corn tortillas and colorful vegetable soup. We took day trips. One was to Merida, where we toured the teeming marketplace. I bought ground pumpkin seeds, a local specialty that are, admittedly, still sitting in my fridge. But it makes me so happy every time I spot the bag; that rich, brown hue. I bought gifts for the kids from kind vendors with stalls set up in the city center, and sampled Mexican chocolate. Another day trip featured a boat trip in Celestun to see the famed flamingos that flock there, hundreds of stalks of pink in a ruddy, shallow expanse of water. Then we steered through the mangroves, saw a bunch of birds that J would have been VERY excited about, and ended the day beachside with beers and plates of fresh squid, bows of ceviche and heaps of fried plantains. On my last full day there, I took a trip to Uxmal, an ancient Mayan city. My mom came along for the ride, although I was the only one who toured the site, as the others had done so on previous trips. The sun was brutal and there were a lot of steps, but I enjoyed every second, soaking up historic details from the guide I’d been advised to hire while rocking a baseball cap and sensible shoes. I was far from home and in the throes of ancient civilization. I couldn’t get enough of that hot hot heat, knowing that the following day I’d be plunged back into the deep freeze of winter. It’d be almost March, sure, but as we all know, March is a cruel joke. I didn’t miss my family, exactly, but at least in the beginning, I really wished they were there - kind of a backwards homesick - and couldn’t wait to plan a trip there for all of us, which is 100 percent something I’d like to make happen. I missed J a lot. I had to stop myself from texting him constantly about all the sights and sounds and wildlife and food and funny moments. I quickly came to realize, however, that although I’d set out hoping for nothing more than some quality time with my wonderful mom, a break from daily demands and indulgence in warmth, relaxation and the adventure of a new place, the trip was more than that. I was obviously not alone, but traveling by myself - detaching from the person who has to be on time for all those pickups and dropoffs every week - was so immediately mind-altering that it was shocking. Having an hour before breakfast and getting to ask myself what I wanted to do with it, so foreign (and it turns out what I want to do is have coffee and read my Michelle Obama book and smell the flowers). I floated in the pool and talked to my new friends about their children and grandchildren. I gossipped with my mom. I listened to music while getting ready in my room. I took tons and tons of pictures of colorful Mexican tiles. It was uniquely refreshing to be on a trip like that. Not really beholden to anyone or having to adjust to someone else’s desires or plans. Not plagued by decision fatigue except for making the continual decision: do I or do I not want a margarita? Now this isn’t news. That taking a vacation from life’s daily stresses is a good idea. Or that taking a break from your children - even your husband - can provide needed introspection and a mental renewal of sorts. That sunshine and a warm breeze and someone else doing the cooking will make you feel really, really good. What did surprise me was how energized I felt, and so quickly. How full my mind had been of the emotional and actual labor it takes to keep family and work and everything else moving along, and how overwhelming that fullness was. How fast I was able to recalibrate to a more peaceful state. We all say these things: be more present, and don’t sweat the small stuff and you only live once and act with intention. Another one of the great things about getting older, at least to me, is realizing the value in all of that. I get it. But I wouldn’t say that over the past few months I’ve been particularly good at it. I was reminded of how it feels, though, when I went away on my own and slowing down was quite literally the only option. I mean, with one activity planned per day, and sometimes zero activities planned, what are you gonna do? Take another run through the woods? No. Too many scary geckos. I slowed down and decided that not only did I want my family to travel more, but I wanted more of this vacation attitude in my real life. Sure, some of that is planning a homemade tortilla night, and making my children listen to Yucatan-style guitar music, like, all the time, get over it, this is what we listen to now. A more important step is trying to remember, at least occassionally, what I felt like when I was on vacation and not trying to remember every last thing. And accepting that maybe it’s my vacation mind that’s in the more normal state, and not the other way around. That maybe it’s not normal to have 17 different action-items buzzing around in your brain on any given day, from attending an assembly at school to responding to five different email invites to scheduling a phone interview to doing a load of laundry because someone, inevitably, doesn’t have any underwear. I can’t stress this enough: I feel beyond lucky to have the above responsibilities, not to mention so incredibly lucky to have gone on a trip that so positively impacted me, while totally avoiding sunburn. I just don’t want to be so regularly hard on myself for occasional failures to be on top of so much. Because I’ve decided - after letting my thoughts drift among birdsong and learning about ancient rain gods - that a breakneck but somehow also fun approach to daily life is maybe not so achievable after all. Just last week we were headed to Art Night at Nora and Gabe’s elementary school, a creative, adorable event that is exactly what it sounds like: a celebration of and call to do some art with fellow students, parents and the staff. We were hanging out at home eating dinner and probably listening to some Mexican guitar music, planning on getting to Art Night a little but not too late when Nora remembered that she was playing violin with the orchestra at the outset at the evening. Now, she just started violin this year, and orchestra is a semi-weekly school activity. I love that she’s part of it, but I’m not talking about Carnegie Hall or anything. Still, she had an obligation to be there. She’d mentioned this to me a few days prior, but I’d forgotten. Evidently, so had she. So we grabbed her violin, threw on coats and rushed out the door. The school is less than half a mile away and we’d planned on walking. I figured with parking an issue at the school on a busy night like that one, it was still the fastest way. J pulled into the driveway just as we were dashing out the front door and I yelled to him to bring Aidy seperately, as she would inevitably take longer to get to get there, needing to inspect every specimen of plant life and talk to every neighbor along the way. Me and Nora and Gabe rushed down the sidewalk and I told Nora to run, RUN, ahead of us and go straight to the gym, where they were playing. And she ran, with her hair streaming behind her, stopping a few times to look questioningly back at me, and then I’d yell at her to keep going. I was so mad at myself for not remembering she needed to be there on time, plus kind of mad at her for the same. But the evening air was not quite as cold as normal, and it was the in-house orchestra at Art Night for christ’s sake. I yelled to Nora again. “Run, but if you don’t make it, it’s ok.” It would be ok, and was also ok that I hadn’t remembered, because remembering all these things is, I’m starting to think, actually impossible. It’s impossible, and fine, I told myself, and felt a solid block of calm land and envelop the night. “It’s no big deal either way, Nora!” I called out. I took a breath. I strolled. No flowers yet, but they were coming. She made it just in time. Several weeks ago, J and I were lying in bed on a weekday morning drinking coffee. This - having coffee in bed before the reality of the daily circus set in - is a thing we used to do on occassion. Then we started doing it slightly more on occassion. And now, we do it every single day. It is the ritual, not the exception. I’ve talked myself out of thinking that early morning runs (which I hate) or immediate preparation for the day is beneficial in any way. For me, for us, coffee in bed is a gentler, and surprisingly more productive way to greet each morning. It’s when we usually have our most in depth talks about our lives and work and the kids. Sometimes we go over financial decisions or logistics. Sometimes I’ll write a to-do list for the day, or compose a few emails. A lot of the time we just quietly read, although if I’ve received any political news alerts overnight I demand immediate consumption of cable news. Also, on a more mundane note, my coffee used to get cold when I’d try to drink it while running around making lunches and reminding certain young individuals in a first loving but then not-as-loving tone to please get dressed, “we do it every morning EVERY SINGLE MORNING FOR THE LOVE OF CHRIST.” Now I drink it hot. I start in with that nonsense once I’m done. So, we were lying in bed having our coffee, and because I sometimes wake up with a freefall of concerns dancing around in my head, concerns I like to immediately pass on to my beloved, whether his eyes or fully open or not, a trait he just adores in me, I began spouting off about how I needed to be a calmer person. I mean, nothing earthshattering about that, right? Lots of us would like to be calmer in this digital, breakneck, all-consuming world of everything. But one of the things that’s different now that I’m a little older is the way I know myself. I may have wanted to be calmer in my 20s, too, and in my 30s. But I was in no way looking for a workable way to approach that. I was so put off by the thought of any type of “self help” or “self care” that I’d instead chastise myself about being the way I wanted to be. “You want to be calmer? Than BE CALMER,” I’d demand as part of my continual internal dialogue. Now that I’m 41, I can definitively declare that, for myself at least, this approach does not work. If I want to be calmer - if I want to be more organized, if I want to get more sleep, if I want to carve out more time for writing - I have to work on it. I’m getting better at recognizing the pitfalls in my planning on issues both emotional and practical, and more quickly moving beyond bemoaning them to just try and do a better job next time. Although not really when it comes the type of fretting about things that leads to a low-level anxiety. That’s what I meant when I said to J I wanted to be calmer. And - also different than the way I thought when I was younger - I’m able to recognize the reasons I want to work on this. Worrying is a drain on an otherwise amazing life experience. It leads me to question when I could be confident and to bouts of grouchiness when I could be joyful. It is disruptive. And annoying. But when I’m alone, which I am pretty regularly, driving around or working at home, I tend to fester, thinking about things that should be dealt with the sort of deft “handling” made famous by Olivia Pope on “Scandal,” except that my problems don’t involve politically motivated murder or anything. I don’t “handle” them deftly though because I like to wade into the large pool of “what-ifs” that accompany these thoughts. I know a lot of people, and definitely a lot of parents, who tend to do this, too. It’s not the end of the world and it’s certainly not one of 2019’s most pressing issues; we’re all surviving just fine. But I’d like to, if possible, diminish these bouts of nagging anxiety. I’d like to recapture a little of the joie de vivre that springs when you’re free to accept it. Here’s some examples of these “issues” (heavy on the quotes, guys). Maybe some of you will identify. I worry about being a good enough dog owner and about how it’s not worth worrying about that, and about remembering to sign up my kids for after-school activities, or if I’m signing them up for too many after-school activties. I worry about travel plans I need to make and then I start wondering, once I’m deep in the muck of airfare and thinking about packing, if we should even go at all. I worry about if I’m doing enough with my life, then in the same fleeting moment I worry about how we were going to have to miss a social event and what if that particular party was key to our lifetime’s happiness? Cara, get over yourself, right? In all seriousness, though, I do want to get over myself. 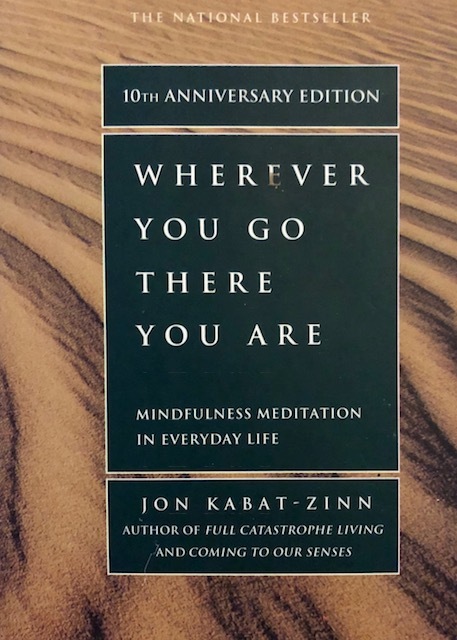 And this is what I was trying to explain to J over coffee those weeks ago, when he, like a handsome sage expressly placed on this earth for my well-being, handed me the book “Wherever You Go, There You Are,” by professor and mindfulness expert Jon Kabat-Zinn. Now, I’ve been resistant to the idea of mindfulness and particularly meditation for quite some time, because I think it’s ridiculous and very much not in the “dealing with it” category of getting things done or taken care of that I’d observed in so many people I admired, including my parents. And, again, Olivia Pope. Yeah, I know. It’s like, obviously. And yet, it’s also like: OBVIOUSLY. Because the truth is that what I - and a lot of us - seem to suffer from, is a perpetual inability to be ok with the way we are or what is happening, even if it’s just small things, and of course when it’s big things. I’ll admit that I spend a decent amount of time wishing I felt a different way about an experience, or worrying about having enough time. But reading just the first few pages of this book, I felt better. You feel this way. It’s ok. Maybe you’ll feel better later. You don’t have time to do these multiple things. Which means, only: you don’t have enough time. I know how overly simplistic this sounds, but I don’t know, maybe that’s the magic. At this point, having read about three-quarters of the book, I am (and I cannot believe I’m saying this) ready to try meditation. And I’m regularly doing this thing recommended in one of the very first sections of the book, which is to remind yourself from time to time, “This is it.” This practice, for me, is a forcefully calming mantra. When I’m running late to preschool drop-off or not getting responses to story pitches or grabbing Gabe for a hug in the hallway, which he resists with his full physical force. This is it. It washes away the stress. It enforces the gorgeous fleetingness.